Product prices and availability are accurate as of 2019-04-22 05:22:20 UTC and are subject to change. Any price and availability information displayed on http://www.amazon.com/ at the time of purchase will apply to the purchase of this product. Oregon artist Dean Carouser portrays nature's mighty wildlife in life-like energetic form through his vibrant and intricate watercolor paintings. Now his break taking portrayals of nature's creatures enliven this collection of tabletop stoneware that includes snack plates and mugs. Mug holds 16 ounces. Wolf mug is a great way to bring the outdoors inside. Coffee cup is made of stoneware. 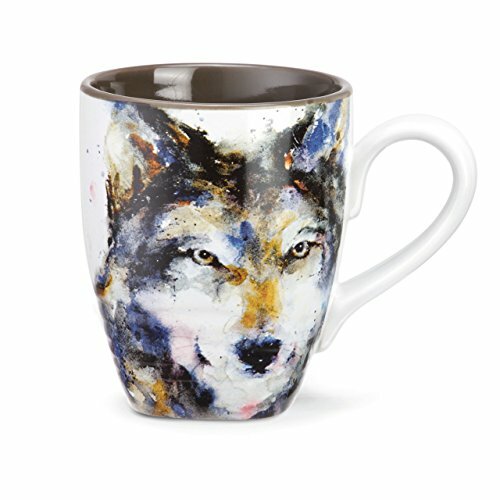 Let your family kick-start their day with a sip of tea or coffee in this charming wolf mug. Mug holds approximately 16 ounces of your favorite hot or cold beverage. Measures approximately 4.5 x 3.5 inches. Perfect for an encouraging display or use in a kitchen. Perfect gift for nature lovers or to add a beautiful touch to a farmhouse. Perfect gift for housewarming, wedding, or bridal shower. Oregon artist Dean Crouser portrays nature's mighty wildlife in life-like, energetic form through his vibrant and intricate watercolor paintings. Ships in protective packaging.